We went out with my aunt and uncle a while ago to the Villa in Wayland. I’ve always heard about this place but never been here. It seems like they have their regulars and do a steady business. and I got a combination of chicken and eggplant which I remember as being pretty good and I like a lot of sauce so I impressed with the amount they put on their dishes. My uncle, as usual, got a pizza. 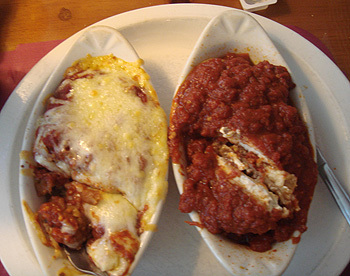 Here, like at La Cantina, they make a square pie. 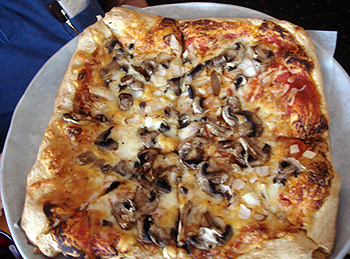 the crust is nice and crunchy on the outside and soft on the inside. While this wasn’t an amazing pizza, it was still very good. The Villa was good all-around, I don’t know if I’d go out of my way to come here and wait in line for a table but we had a nice meal and it’s good to see an older restaurant do well and have some place for local people to meet up. My parents used to take us to the Villa when I was a kid (and that was a long time ago). They don’t have it anymore, but I’d get the Italiano burger (big burger with sauce and lots of melted cheese on Italian bread) and a loaf of onion rings. It was the best. The Villa is a good family restaurant. They have a magician that comes to the tables on Sunday evening. We’ve had them cater parties for us and the food was excellent. I’m glad to see the Villa is still in business. 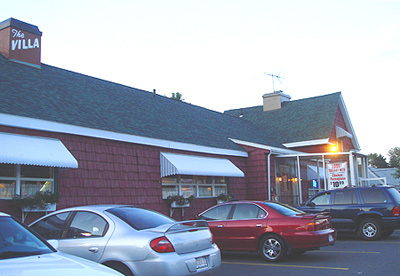 My parents used to take me there, from the time I was a little kid living with them in Framingham–almost 50 years ago!–right up till I was old enough to have a drink with them. 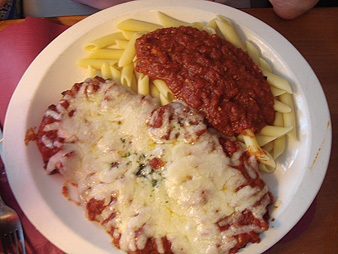 I used to love the Veal Parmigiana; the sauce was almost as good as my mom’s.